Love a good Vietnamese bahn mi sandwich but want fewer carbs? Try this meal prep recipe for meatballs served in bowls of rice noodles and spiralized cucumber and carrot. To make the mouth-watering meatballs, simply combine a flavorful blend including jalapeno, garlic, ginger, ground pork, and panko bread crumbs. A creamy sauce made with healthy Greek-style yogurt brings all the flavors together. The bowls can be topped with a colorful variety of jalapeno peppers, cilantro, and scallions! Not a fan of pork? Use ground turkey instead! You will love having meals ready to go for the week! Per Serving: 624 calories; 38g fat; 32.8g carbohydrates; 38g protein; 161mg cholesterol; 1466mg sodium. This is absurdly tasty. The sauce is insane!!! I'm still fairly new to meal prepping, but this recipe has made me an instant fan. So quick and easy, delicious flavor, and makes the perfect portion sizes. The sauce is also a must have! It's so good, I'll probably also use it for other dishes as well. 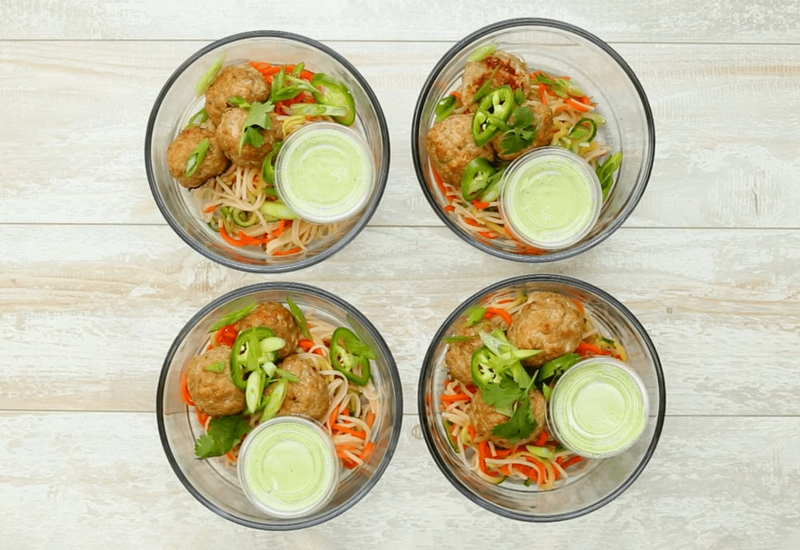 These Asian inspired meatball bowls were terrific. Overall the flavors were a little sweet, a little spicy, and a little tangy. I am a huge fan of traditional banh mi sandwiches, and I love that this dish captures all of those flavors but without the heavy bread and carbs. The rice noodles and veggies are amazing together. This recipe has stepped my meal prep game up to a new level! I used my new spiralizer to make these delicious meatball bowls with carrots and cucumbers. I substituted pork for ground turkey, and loved it. The meatballs were so full of flavor thanks to the ginger, garlic, jalapeño, and green onions. This is such an easy recipe to prepare that doesn't take all day when you're trying to meal prep for the week. Delicious, quick and easy Bahn-Mi inspired bowl. I love to make this recipe ahead and take to to work. The sauce is absolutely delicious, not too spicy and incredible flavor. This dish took a little work and time but was well worth it!! The flavors are wonderful especially for this time of year when the vegetables are not at their peak flavor, I will make it again when they are.